Malik Bendjelloul's revelatory and compelling Searching for Sugar Man is a documentary about the Mexican-American singer-songwriter Rodriguez, who was momentarily hailed in 1970 as the finest recording artist of his generation, and then disappeared into oblivion – only to rise again from the ashes in a completely different context, a continent away. Searching for Sugar Man is a film about hope, inspiration and the resonating power of music. In the late '60s, a musician was discovered in a Detroit bar by two celebrated producers who were struck by his soulful melodies and prophetic lyrics. They recorded an album that they believed was going to secure his reputation as one of the greatest recording artists of his generation. In fact, the album bombed and the singer disappeared into obscurity amid rumors of a gruesome on-stage suicide. But a bootleg recording found its way into apartheid South Africa and, over the next two decades, it became a phenomenon. Two South African fans then set out to find out what really happened to their hero. Their investigation led them to a story more extraordinary than any of the existing myths about the artist known as Rodriguez. 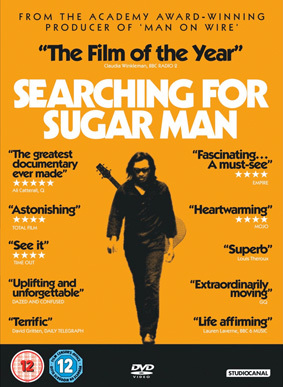 Described by Q Magazine as "One of the greatest, and most moving documentaries ever made," and by The Telegraph as a "Terrific film, and an amazing story," Searching for Sugar Man is coming to UK DVD and Blu-ray on 19th November 2012 from Studiocanal at the RRP of £17.99 for the DVD and £22.99 for the Blu-ray.